We are excited to announce that as of May 1st, 2017 we are officially moved in to our new location at 5 7th Ave N in Hopkins! Cameras for enhanced security and access for parents to be able to watch classes! Instructors Joelle, Frankie, David, Jake, Zack along with Studio Manager Bao and Jake/Bao’s daughter Genevieve posing for a photo upon completion of the moving process. More photos of the new studio and updates will be posted soon under our “RENTAL/EVENTS” tab. 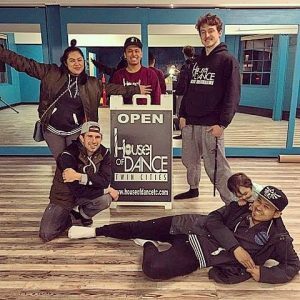 For more information on our new studio and upcoming summer classes, please email us at houseofdancetc@gmail.com.